This is freedom funk. A political dance record. Detroit’s revolutionary soul man, Nadir, rebels against it. His solo debut Distorted Soul 2.0 was crowned “Best Funk Album of the Year” by Soul-Patrol.com and earned a Detroit Music Award for “Outstanding Urban Funk/Hip-Hop Recording”, after international spins on Urban A/C, Rock, Urban Contemporary and even Smooth Jazz radio. Slave: The Remixtape, which offers fourteen very different remixes of Nadir’s award-winning composition “Slave” (and six additional tracks online) - in Crunk, Funk, Hip-hop, Rock, Funky House, Techno styles and more - was a #5 Breakout track on Billboard’s Club Play chart, and took home a Detroit Music Award for Outstanding Electronic Dance Recording. On Nadir’s new album, Workin’ For The Man, revolutionary socio-political commentary collides with explosive funk and hip hop. 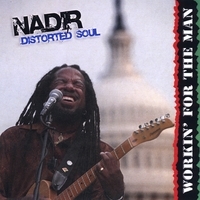 Nadir describes the album as a “political dance record” designed to make you dance and think at the same time. Witnesses can catch Nadir skanking funk guitar on tour in the U.S., Canada or Europe, or rocking an acoustic in front of the White House demanding that George Bush step down. His funk-rock jam band, Distorted Soul, rips through Nadir’s diverse originals, then fires off hard rocking versions of soul classics like “Love TKO” or reincarnates rock anthems like “Life in the Fast Lane” as dance floor friendly funk burners.